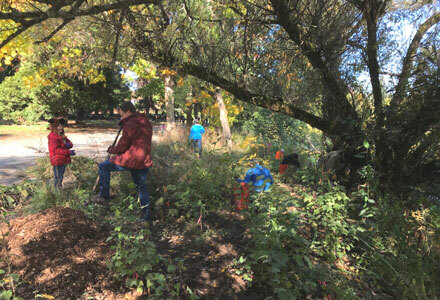 Come to a Green Lake Work Party Saturday, December 8th, 9AM to Noon! Meet: East End of the Small Craft Center Docks, near the old Aqua Theater and the Pitch and Putt Golf Course. Look for wheelbarrows, tools, signs and people wearing orange vests. We will be grubbing out invasive non-native Himalayan Blackberry Vines (which are actually Armenian, not Himalayan, but that is another story) along the west side of the lake adjacent to where West Green Lake Way North merges with Aurora Avenue North. This will be muddy work. Dress for weather. Wear close-toed shoes. Bring a bottle of water. Questions? Call Rob Hutcheson at 206-854-1654. You can also find more information on Green Lake Stewards Work Parties on Friends of Green Lake Calendar at any time.